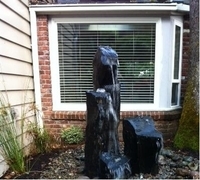 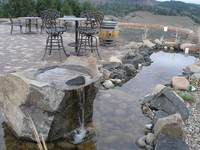 Corbett Basalt Column Water Feature - big sound! 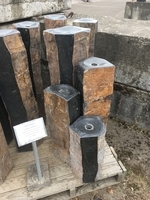 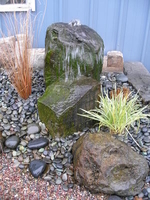 We select the most interesting specimens to be drilled for water features and keep a large assortment of these beauties on hand at all times. 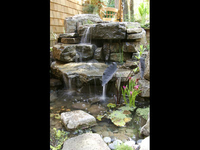 Some will be bored for water to splash on all sides but the most sought after columns are bored so the water falls down a sloping top and becomes airborn as it accelerates down the face and drops into the water below. 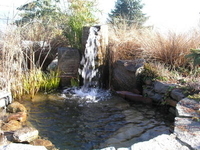 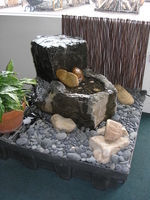 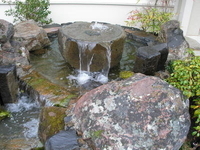 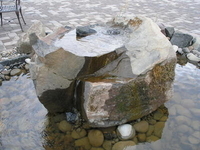 The best sound is water falling on water but many folks do like the "tinkling" sound of water falling on wet rock. 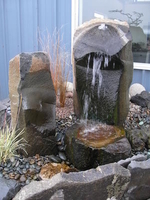 We drill our basalt bowls just off the edge of the high water mark for maximum sound effect AND so the bowl becomes a STILL feature when the pump is turned off! 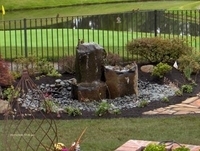 Most of our bores are 1 3/8" which accomodates 1" PVC pipe, however, we can do larger boring upon request. 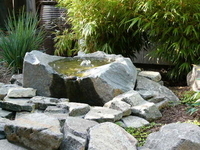 Also, if you find a rock at Pacific Stonescape that isn't bored and you would like it to be, we can do that for you in most cases.